Lovely gift of stylish shobhas green and beige coloured cotton and chiffon salwar kameez to make someone’s day. This salwar kameez is very well blended in green and beige and has fabulous designs in the neckline, borders and sleeves. 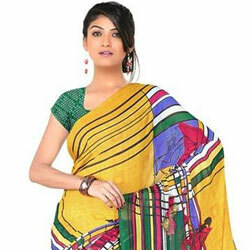 It is provided with a green bottom and matching dupatta.